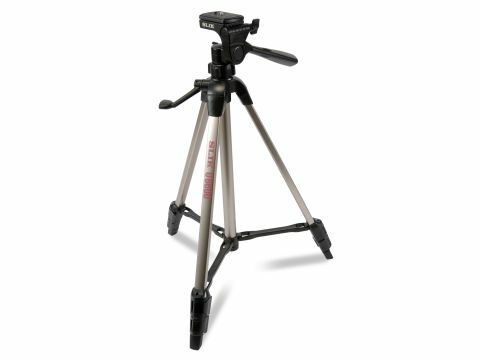 A cheap and good tripod, is it possible? At just £39, the Slik U6600 is very cheap indeed. It looks pretty good on paper, too, with braced legs for extra stability, a decent maximum height and simple, classic construction, plus you get a three-way head included in the price. When you handle it in the flesh, though, it's altogether less impressive. It feels very light, which is good if you've got to carry it long distances, but unless this is married to above-average engineering, it suggests less-than-perfect stability. And that's what you get, alas. The legs feel distinctly flimsy as you're unlocking the sections, and even at minimum column extension, there's a good deal of general flex in the tripod. At full column extension, it's going to be hard keeping the camera steady enough for a sharp shot because of the degree of wobble. The centre column's moved using a gear and crank mechanism which is slow to operate - and it also makes the tripod twist and flex while you're doing it. What's more, when you fold away the crank, it gets in the way of the column locknut as you try to tighten it. This tripod does have its good side. While the pan and tilt axes are distinctly 'sticky', there is a quick release mechanism. Overall, though, the U6600 is disappointing, even at this price. It's light, yes, and reaches a good height, but it feels flimsy, and though your camera's in no danger of toppling over, it may not always be easy to get sharp shots.